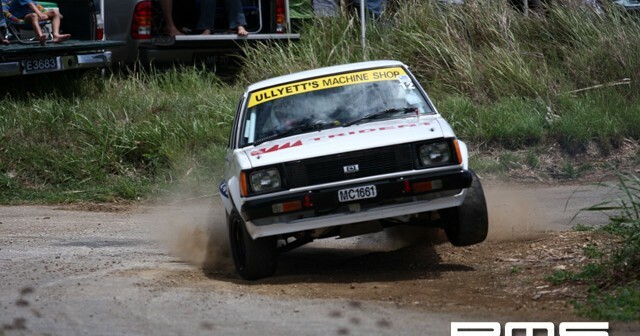 Twice winner of the island’s premier event, Paul Bourne completed his preparations for Sol Rally Barbados 2010, which marks the 20th Anniversary of the inaugural running of the Club’s International All-Stage Rally, with a dominant victory in Shell V-Power King of the Hill yesterday (May 23) in front of a crowd of thousands. Bourne set the pace on the single practice run in the Banks/Chefette/LIME/Virgin Atlantic Ford Focus WRC 07, clocking a time of 2m 01.55s, more than 10 seconds clear of the field; Roger Hill (Esso/Nassco/MotorMac Toyota Corolla WRC) was second on 2:11.80, ahead of the hard-charging two-wheel-drive front-runners – Ian Warren (Automotive Art/Shell V-Power/Simpson Motors Suzuki Swift) on 2:12.89 and Josh Read (Automotive Art/Baram Services Toyota Starlet) on 2:14.41. The first official run gave a clearer indication of how the day would play out: Bourne lowered his time to 2:00.90, with Trinidad’s John Powell now second (2:03.91), a late change of co-driver seeing Brit Craig Thorley sitting in the Shell Helix Subaru Impreza WRC S12. England’s Paul Bird was third in the supercasino.com/Vent-Axia Ford Focus WRC 08, just over three seconds adrift of Powell. Despite improving his time by more than three seconds, Hill had now slipped to fourth, with Sean Gill fifth (2:10.96), using the day to learn the intricacies of the ex-Gigi Galli Shell V-Power/Automotive Art Mitsubishi WRC; an impressive sixth was England’s Rob Swann (Automate CGI/Waves Hotel and Spa/Revolution Wheels/R A Swann Ltd Subaru Impreza N14), on 2:12.02, two seconds clear of the Mitsubishi Lancer Evo IXs of local Group N front-runners Barry Gale (redlinefuels.com/Autolink/Maxi Malta/Rockstar Energy Drink/Metal Craft Works/Weetabix/ Bella Beauty Supply) and Geoff Noel (Globe Finance Inc/Mix 96.9/Sentry Insurance Brokers/Dewalt Tools/Automotive Art/Ezone). With the top 10 now running at the end of the field in reversed order of seeding, the final two runs saw improvements for nearly all the front-runners: on run two, Hill found another three seconds (2:05.31) to move ahead of Bird into third place, while Warren (2:10.22) was still leading the two-wheel-drive battle, now fifth overall and ahead of Simpson Motors team-mate Gill. A big effort from ‘Birdy’ on the final run (2:04.82) moved him back ahead of Hill, to finish third behind Bourne, whose last run (2:00.16) was his best, and Powell, who had failed to improve on his first-run time. In Group N, Noel closed to within eight-tenths of Swann on his second run (2:12.82), but then Gale pulled out all the stops on his final run for a 2:10.37, which placed him seventh, with Swann’s first-run time still good enough for ninth, while Noel slipped out of the top 10 to 11th. A fine second run of 2:12.66 for Graeme Finlayson (www.racedandrallied.com Mitsubishi Lancer Evo III RS) saw him claim 10th place. 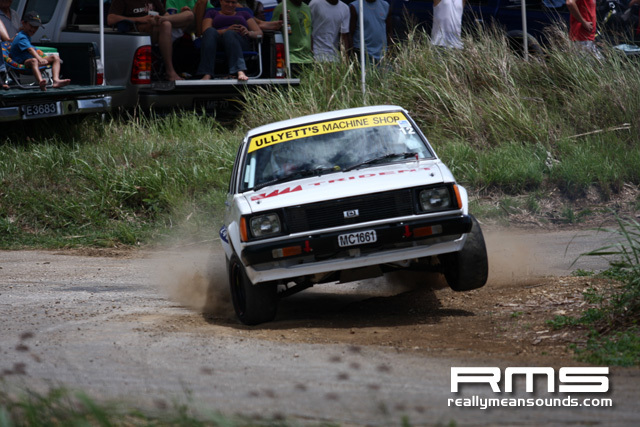 Some good class battles are in prospect, too, with Read likely to come under pressure in SM9 from Neil Armstrong, who is making steady improvements to the Pit Bull Energy Drink/Hankook/Gunk/Electric Avenue Toyota Starlet. In Modified 6, points leader Edward Corbin (Automotive Art/Klark-Odio/Corbins Garage/JVM Signage Daihatsu Charmant) is looking forward to fighting back next weekend, after finishing second to Dane Skeete (Williams Trading Inc Peugeot 206), while Scotland’s Kenny Hall (Halltune Ford Puma) was not far off the pace. The day was interrupted by a number of incidents, the most severe of which involved Nick Gill and Sue Rogers, whose Mazda 3 rolled on the approach to the Esses; both were taken to hospital for checks. Other casualties were the BMW M3 of England’s Martin Stockdale, Toyota Starlet of Marc-Lee Bascombe and Vauxhall Astra of Adrian Linton. Sol Rally Barbados 2010 (May 29/30) and Shell V-Power King of the Hill (May 23) are organised by the Barbados Rally Club, which celebrated its 50th anniversary in 2007; title sponsor is the Sol Group. Marketing partners are Simpson Motors, LIME, Automotive Art, Banks and Karcher; official partners are the Barbados Hotel & Tourism Association, Barbados Tourism Authority, Divi Southwinds Beach Resort, Geest Line and Virgin Atlantic Airways; associate sponsors are Stoute’s Car Rental, Glacial Pure and Chefette.